Ten Strawberry Street Belmont Silver Beaded Clear Glass Charger Plate 13"
Home > Products > Ten Strawberry Street Belmont Silver Beaded Clear Glass Charger Plate 13"
Add a classic and romantic ambiance to any fine dining setting with the Ten Strawberry Street Belmont Silver Beaded Clear Glass Charger Plate 13". 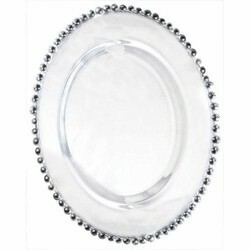 Perfect for weddings, anniversaries, and special upscale events, this stunning charger plate is accented with silver beads along its rim that beautifully frames dinner plates, platters, and bowls. Made from premium quality glass, this charger plate is exceptionally durable making it ideal for multi-purpose use. Combining style, longevity, and functionality, this charger accommodates any size plate and protects against spills and mess. For proper care and maintenance, this charger plate must be hand washed only.